Hi there, we are HAPPY! Happy is a family company based in Belgium. The story started in 1986 when Dirk, a crazy inventor from Zoersel, created the Happy Cube©® puzzle. And so, the HAPPY company was born more than 30 years ago. Today, it remains our aim to challenge people into HAPPY-ness with our brain training 3D cubes. We welcome you to explore and experience their endless possibilities. Test your flexibility on handling changes, develop your spatial insight and last but not least… be persistent and make yourself HAPPY! 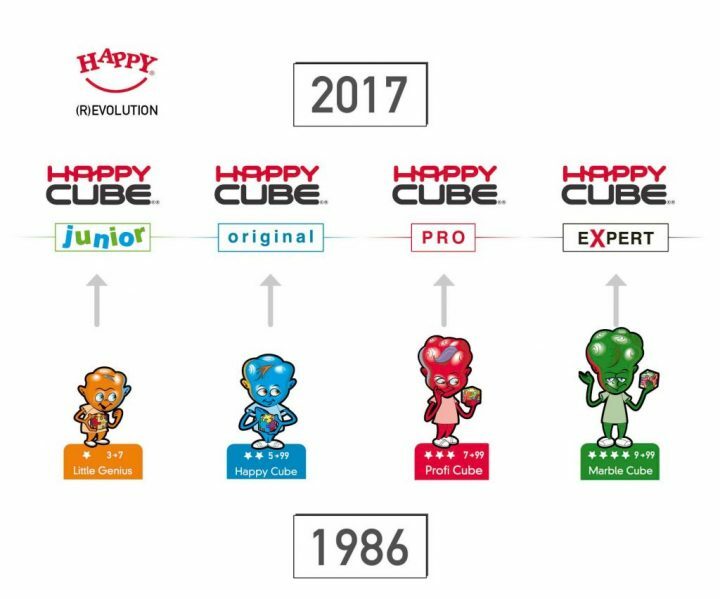 Around 1990, the Happy Cube puzzles started to have different trade names, from Coco-Crash in Spain, the Wirrel Warrel Puzzles in the Netherlands and Happy Cube in Germany, Denmark and UK. We also expanded the product line to Little Genius for children and to Profi Cube & Marble Cube for the more advanced puzzler. These designs were also set specific, so they can be combined together to make 4 cm cubes. In 2017 we decided to rebrand our 3D puzzles to “Happy Cube” and put them in brand new packaging. Beside our well-known Happy Cube collection, we also have some more budget-friendly cubes. The six-edged Planet Cubes – also named Snafooz , and a the very small Micro Cube of 1x1cm. For the youngest puzzle wizards, there is an easy pre-school puzzle: the Smart Cube. This cube set can be combined with the Happy Cube XL set… as they are both 5cm cubes. HAPPY is passionate about children’s growth, development and the flexibility to handle changes. Our mission is to create fun, high-quality, safe and eco-friendly puzzles, toys and games that are globally represented. 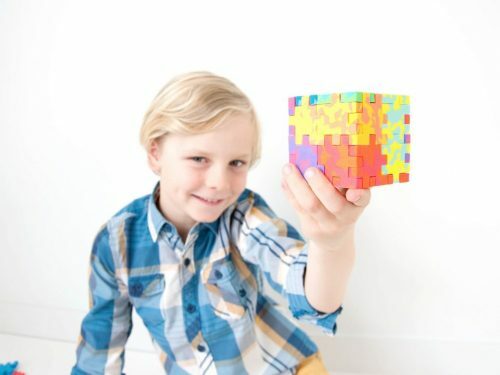 Happy Cube puzzles are loved by puzzlers of all ages worldwide, they… create, play and learn! Fun for all ages, try it with the whole family! HAPPY’s main product is the brain tickling Happy Cube ©® puzzle. It is a one player game, that certainly brings hilarious dynamics while swopping puzzles between two or more players. Our © & ® invention! The Happy Cube © and several other ideas are registered with the United States Copyright Office with several works (s.a.TX2332525, VA440889 and others). All logos are international protected ®Trademarks. 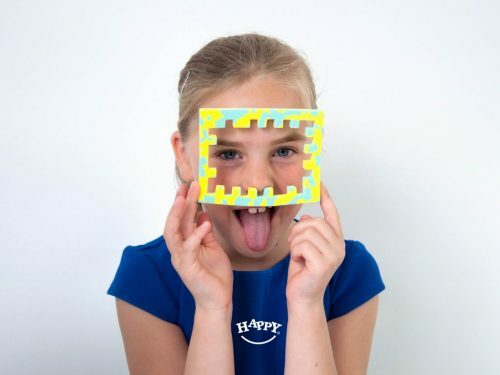 The Happy Cube puzzles are manufactured and worldwide exclusive distributed by Happy bvba from Belgium. For kids, we focus on the development of specific skills. These range from stimulating fine motor skills, to recognizing colors and shapes, and building spatial intelligence. Everyone plays according to his/her own competence and creative approach. For schools, we have developed a class product; the Smart Cube Edu pack. It comes in a robust classroom box that will endure the hands of toddlers. To find out more about these educational purposes, check out the educational page. 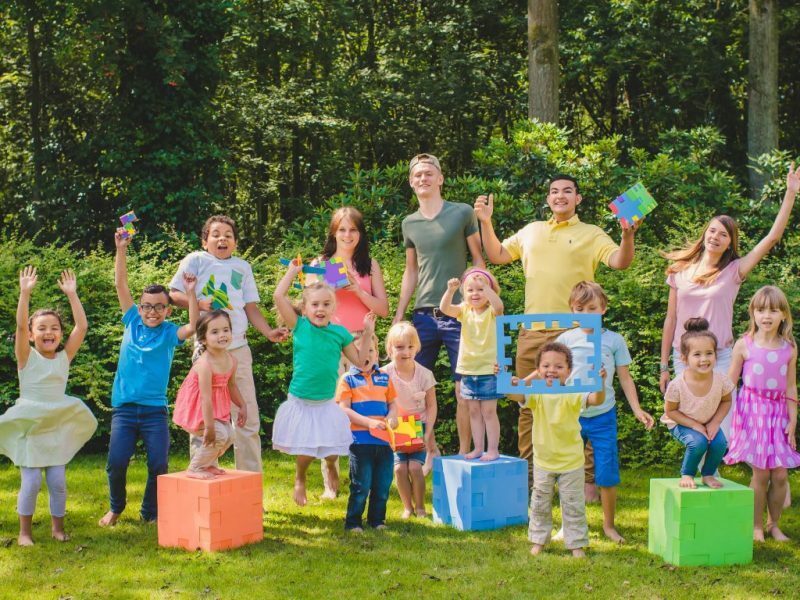 Not only children and teens love playing with Happy Cube… Adults enjoy to challenge each other on parties and family dinners. Happy Cube has all it needs to upgrade your inner self. Since all challenges are feasible, you develop your self-esteem and improve your flexible and strategical thinking. Be persistent and make yourself feel good about yourself! We also manufacture Happy Cube for promotional purposes. So, it is possible to print your logo and message on the puzzles. Besides the Happy Cubes. 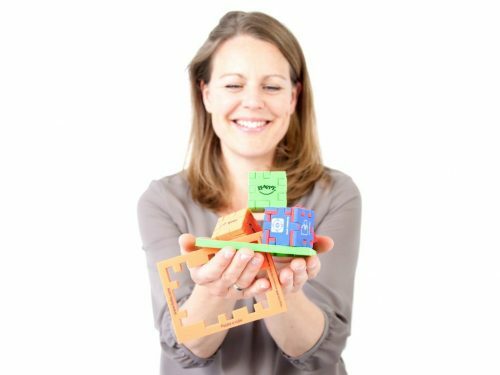 The Happy Cube is a great product-idea that makes the puzzler act and think, stimulating the mind like no other product can. No wonder this puzzle was well received as a promotional give away! It appeals to 3D puzzlers of all ages, parents and professionals. Happy Cube promo has several options ranging from model, size, color to print. It’s all made to the client wishes. Our clients are Intel, Bancontact , TomTom, McDonalds, Weetos, Kangaroo, Danfoss, TNT, HP, Ikea, Pepsi, Skittles and many others. Please visit www.happy.be for detailed information. We manufacture promotional products such as comfy flip flops, soft and safe Air Gliders, fully customized key Holders and foamy seat cushion… We offer a large scale of tailor-made original EVA foam products that match your message and audience, while still being affordable. Every day we invest in your HAPPY-NESS, because we love our product… and we hope you do too. We care for our children and Planet Earth. It is a conscious choice to use ‘ethylene vinyl acetate’ or EVA foam material as basic material for the Happy Cube puzzles. Even more…. it is the backbone of this puzzle concept. The flexible, soft and lightly stretching structure enables the ‘cling on’ when the puzzle pieces are combined into a cube. The foam carries the constructions as a solid puzzle. "EVA is one of the least harmful synthetic materials. With optimal combustion, only CO2 and H2O are released, so thermal recycling can be done. The calorific value of EVA is similar to that of oil. So you can say that EVA is a rather environmentally friendly plastic." The EVA foam Happy Cubes are long-lasting toys. Luckily, the EVA is also washable at 30°C. So you can refresh the puzzles and keep your toys and children clean. But please, do not tumble dry! HAPPY is committed to produce only the highest quality products using superior materials with an emphasis on safety. We manufacture the EVA in EUROPE conform the strictest quality and safety regulations. Our foam is conform the current legal EU toy directives (EN71 part 3) and to the US ASTM (American Society for Testing and Materials). Unlike many manufacturers from Asia, we do not use harmful chemical additives to enhance the product volume and profit. Safety comes first! We ensure that our products are safe for consumers and workers and meet all international safety standards. Our Happy Cubes are produced without toxic materials. Our games have been tested and approved by TÜV-Rheinland and TÜV-Hong Kong. Test reports are available on request. HAPPY believes in the power of beautiful and functional ecological and economical packaging. Due to the very light and compact packaging, energy, space, and therefore money is saved during the production and transport. The puzzle concept is explained by several logos and colourful 3D puzzle designs on the packaging. We do not waste precious paper and trees on extra manuals. Each packaging is designed as compact as possible, to ensure efficient paper use and transport. No air to transport! Feel invited, we look forward receiving your request to be part of our distribution network.